A couple of weeks ago my mother was passing through Washington on a night when I was planning on prepping for a column. My mother knows me as the picky child who refused to try anything new and wiped peas off noodles in her pasta carbonara before eating it. So, I thought having a meal with her son who tries all sorts of new foods and writes about them could be fun. That is when I remembered that Jaleo (480 7th Street NW) had been renovated semi-recently and was celebrating its 20th year in D.C. I texted my mother with the suggestion, letting here know it was a Spanish tapas-style restaurant, and when she responded with, “Oh, sounds good,” I made the reservation. Jaleo is a Spanish word that means revelry and fun and you feel this festive spirit the moment you step into this redesigned space, from the foosball dining tables to the murals on the wall. 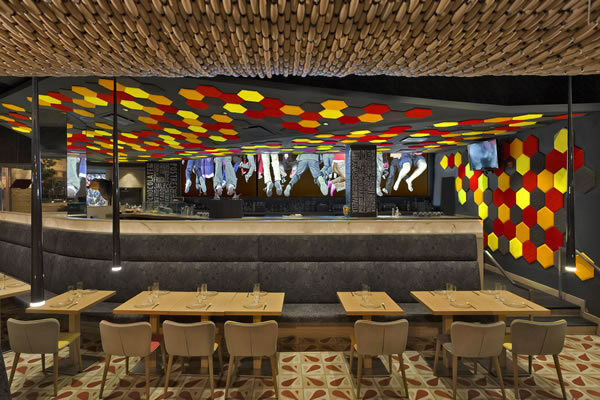 The restaurant is full of bold colors and sleek furnishings and the artwork clearly embodies the meaning of the work jaleo. This playful space was truly pleasurable to dine in. For drinks we decided on the sangria de cava, which is a whole bowl of sangria mixed tableside. The sangria was sweet, fresh and an excellent pairing for the food that followed. Our first course would be a selection of cheeses and an assortment of cured iberico meats. The manchego, one of my favorites, was tangy and served with compressed apples in muscatel and the cana de cabra was a luscious goat cheese served with a delectable fig jam. The iberico meats were fresh delicate slices of meat from the legendary acorn-fed black-footed iberico pigs of Spain. It was a great way to start the meal. As we finished our first course we decided on a few other items to order, including the “setas al ajillo con la serena,” which are sautéed seasonal mushrooms in a cheese potato puree and a plate of seared piquillo peppers stuffed with goat cheese. Both dishes were brilliant but the perfectly prepared mushrooms in the rich, fluffy potato puree were a favorite. Then the dates wrapped in bacon arrived; this was a superb rich and sweet combination. Another item in this course, which did not want to be overshadowed by the bacon wrapped date, was the chorizo wrapped in crispy potato, which was scrumptious. The seafood portion of the menu was up next. I made sure we ordered the “Gambas al Ajillo,” described as the “very, very famous tapa of shrimp sautéed in garlic.” We also ordered the seared scallop and the jumbo lump crabmeat salad. While the shrimp may have been the “famous tapa,” and it was enjoyed, it was not the winning item in our opinion. That was a tie between the other two tapas: the scallop with pine nuts and Pedro Ximenez, each amazing. They were cooked perfectly, smooth and tender with a hint of sweetness and they melted in your mouth. The cold lump crabmeat salad with cucumbers, peppers and tomatoes in a brandy sauce was crisp and refreshing. We tried a few other dishes on the menu including the brussel sprout special. My mother discovered she liked them, though I still think they look and taste like alien eyeballs. Each dish that arrived at the table was very good, some were extraordinary and many more piqued our interest, so another visit may soon be in order. With the savory portion of the night behind us, we tried a couple items off the dessert menu. With our waiter’s assistance we decided on two desserts: the Manzanas “Carlota” al PX and the Gin and Tonic sorbet, Jose Andres favorite cocktail made into a dessert. The apples Charlotte was a delicious option, however at least in the opinion of the four of us at the table, gin and tonic should remain a drink not a dessert. When all was said and done, Jose Andres and his head chef at Jaleo D.C. Paul Yeck deliver an excellent dining experience in an energetic atmosphere. All our courses were luscious, the company was entertaining and my mother appreciated her meal. So, whether you are dining with mom or friends, Jaleo is a worthwhile flavor adventure and the food is just part of the fun.